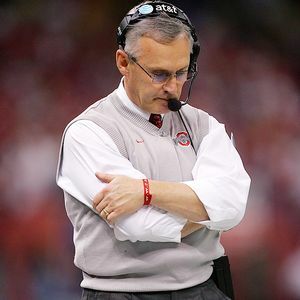 Former Ohio State head football coach Jim Tressel seemed to be a role model for achieving on-field success with a high level of character. Two-time National Coach of the Year, Larry Coker and former player Randy Shannon also were thought to provide moral leadership while winning national championships during their tenure as head coaches for the University of Miami. Yet, both storied football programs now find themselves in the middle of NCAA investigations for major rule violations. Reports of players trading memorabilia for cash or discounts, receiving cash and “entertainment” from boosters, and at least one of these coaches admitting to lying about their knowledge of these events has triggered a frenzy of discussion on what’s wrong with college athletics. As head coaches often claim at their post-scandal press conferences, the buck stops with them as they have overall responsibility for the program and its players. Being in the hot seat requires a coach that can provide the balance between ultra-competitive, “win now” demands of fans and boosters and long-term development of players’ skills and character. Several recent research initiatives have looked at this unique role and how to walk that fine line. Before arriving on a big-time college campus, elite athletes are exposed to multiple coaches. Certainly, these coaches influence the player’s knowledge and skill level in their sport, but exercise science researchers at Concordia University in Montreal have documented a link between coaches and players in moral and ethical development. Through interviews with elite coaches and athletes, Sandra Peláez and Simon Bacon found that after parents, coaches can become significant influences in moral guidance for athletes. "Coaches are mentors, parent figures, career enablers, and judges -- all at the same time," lead author Peláez said. "Every coach, however, doesn't influence every athlete he or she works with. The coach-athlete relationship is what enables a coach's influence and therefore determines how much influence a coach has. We found athletes would evaluate the relationship with their coaches and then decide whether to accept moral guidance or not." Of course, defining what is meant by the term morals is slippery. For this study, four core moral values were defined. These were "elite sports involvement" (i.e. discipline), "interaction with others" (i.e. respect), "self-related" (i.e. enjoying the sport) and "game" (i.e. striving to win). Also found in the study was the importance of cultural differences between coach and player as well as the generational influence of coaches being mentored by their former coaches. Attitudes towards sports also begins at much younger age and helps set the stage for future behaviors. A “win at all costs” coaching mentality has been found to be less effective for player development than a mastery method which emphasizes positive communications and learning the sport. Recently, University of Washington sport psychologists interviewed 243 children -- 145 boys and 98 girls -- playing basketball in two separate Seattle leagues. The athletes ranged in age from 9 to 13 and 80 percent were white. They were given questionnaires to fill out twice, once prior to the beginning of the season and again 12 weeks later when the season was almost over. Those kids that played for mastery coaches reported having more fun and enjoying the sport. "One consistent finding of our research is that a mastery climate retains more youngsters in sports. It keeps them coming back," said Ronald Smith, a UW psychology professor and lead author of the study. "Retention is a huge problem in some youth sports programs. An important reason to keep kids involved in sports is that it reduces obesity by helping them be more active." Like their athletes, elite college head coaches can often reach rock star status, as well. This can cause problems if the coach cannot adapt to new situations for fear of trying new methods and not having an answer for everything. "Coaching is complex, continually changing and influenced greatly by the context, athletes' circumstances and the developing relationship between the coach and the athlete,” claims Jim Denison, PhD, of the University of Alberta, and co-author of a new paper on positive coaching and ethical practices for athlete development. “When coaches achieve an expert status they tend to want to maintain that, so admitting that you don't know becomes a threat to their expertise." So much is riding on a successful NCAA Division 1 program that a head coach may not be able to step back and admit a mistake or a problem with their players. "It's hard for that person to express uncertainty, or be open to new ways of looking at a problem or consulting with others,” added Denison. "You cannot begin to 'problemetize' until you acknowledge and recognize that the knowledge you have is socially constructed based on a lot of take-for-granted ideas and traditions that have become dominant. We invite coaches to think more critically about how they think and what they do, to 'problemetize' their assumptions and to open their minds to look at their coaching practices critically and with the opportunity to try new things without feeling threatened by change." Of course, easier said than done. With so many strong influences on college athletes, head coaches will need to develop strong relationships with their team and even stronger support from their universities and fans in order to provide a championship with character.